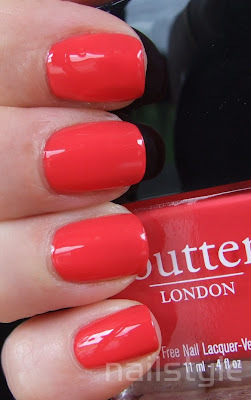 I couldn't wait to try out this gorgeous colour from Butter London. This lovely is called MacBeth and it's a vibrant coral red jelly. The pictures really don't do this justice as it's nearly neon and super shiny. The formula is easy to use but needs three coats to be opaque. This isn't my swatching hand but I'd already started stamping my left hand and wanted to show MacBeth on its own. With stamping . . . I love how loud and vibrant this turned out! In fact I even have it on my toes. lol Perfect for our summer days just starting to peak in. Beautiful color on it's own, but even more beautiful with the golden stamp on it. I love the color! It is so pretty with the stamp! 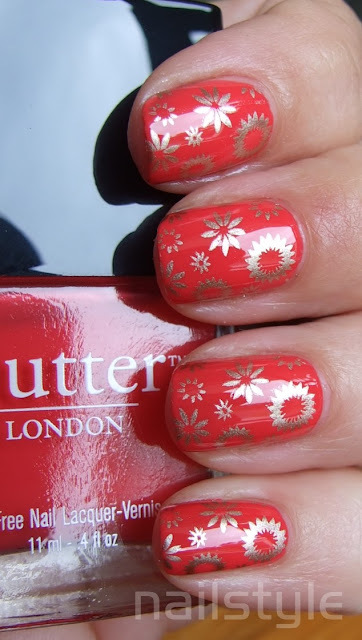 your stamping is so perfect!! I only added my blog link to show you to the page where I nominated you. I like your blog very much and I gave you the Cute Blog Award!